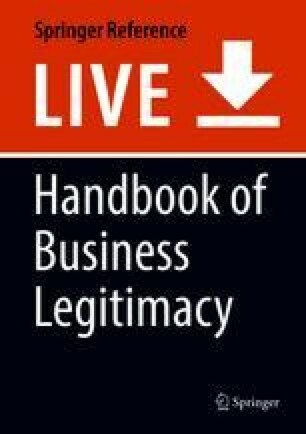 In this chapter, the economic theories of the firm are used to ask what they can contribute to the legitimacy of business. The first step is to provide arguments why firms exist at all, and not only markets, and why the capitalist firm is the prevalent form of firms. In a second step, theories of the firms and their implications for business legitimacy are presented. Besides the dominant agency and contractual theory on the one hand and the stakeholder theory on the other hand, the legal theory of the firm is introduced, as well as the resource-based view of the firm and the behavioral theory of the firm. In a third step, a broader economic analysis is applied in which the existence of market power, multinational and “footloose” enterprises, and lobbying activities of firms are considered. Last, but not least, four methods of social norm enforcement are discussed, namely, consumer choice, business reputation, financial markets, and stakeholder interference. After all, the dominant legitimation of business comes from the provision of economic values in form of goods and services in a socially acceptable way. Even from a well-understood stakeholder perspective, long-term value maximization is seemingly the adequate firm objective.